The OurSay website is inviting us to “hang out with the Prime Minister” – nothing I could think of could possibly be worse, but anyway – and you have the chance to vote for the three questions she will be asked [Update: link fixed to show most popular questions first]. You may recall that ACM’s question on OurSay’s The Climate Agenda reached third place and therefore received a full page article in Fairfax – that must have hurt. Let’s see if we can make our hopeless PM squirm, shall we? Register at Our Say and you have 8 votes. Use them as you see fit – you have just over three days left. 1st Question; How quickly can she pack up and move out of The Lodge? If she mentions ‘karban ploshon’ one more time, I’m going to scream! And when she is leaving the lodge these are the only words I want to hear………”RELEASE THE HOUNDS”!!!!! Thanks for your support (mine is question #2) which I don’t believe has ever been asked. Unlike the off the cuff “There will be no carbon tax etc”, my question addresses the official position taken by Gillard and which she so stridently promoted at numerous press conferences. and for this reason you government will not lift a finger to stem the flow of boats and in fact your government now escorts as many boats as possible? Graham Richards – that’s a given. The more civil disruption the socialists can cause, the easier it is for them to infect our society. all my votes are used 🙂 keep pushing guys !! I’ve never seen her answer a question ever. She will just reply with one of her usual down the garden path waffles until everyone forgets the original question. The only trouble with asking her questions is that I guess you are obligated to listen to her answers……… That’s just too painful. to China ? At the moment they are having it both ways…….. blaming coal for catastrophic global warming and filling their coffers with taxing the miners who are exporting the “evil” stuff to China. 0.0035 deg C is wildly optimistic … and impossible to measure. Why would lying again bother her? Voted, in support of the two already top questions, but it felt good. Oooh yeah. Bring on those lies, Jules Baby. 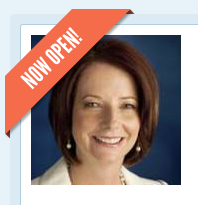 If you take a look at http://tinyurl.com/ctpyhwd , you can see that we at the International Climate Science Coalition are collecting comments and ratings on the public remarks of PM Gillard about climate change as posted on the Herald Sun Website after her blogging session there 10 days ago. We will be sending the best comments to her office, the opposition and the media, as well as posting a summary of the most useful and interesting comments we get on our Website. Any ideas how to get significantly more than 1 millionth of your countrymen and women to comment and/or vote? Hope people can try out the form and let us know if this is easier. I think the oursay website is rigged. I just went there and it says “You have 7 votes left”. Maybe they made my first vote for me… on the question that THEY prefer. Even if the most popular question ends up being the winner, don’t expect a straight answer from Gillard, since she probably doesn’t even know anyway. I fully expect her to attempt to dodge it with the usual “Australia is doing the right thing” (or similar) mantra. I popped over to the Herald Sun “live blogging” experience with that “thing” a couple of weeks back. Reading the half arsed, contemptuous and evading standardised answers to some of the good questions put to her not only made me furious, but tune out and lose interest after about 10 minutes. Was going to send in a question myself but I had far better things to do with my time; I needed to clean out the grease trap.